Information on all aspects of Taekwondo can be found here. On joining Carlton – Arena Taekwondo, a student will start as a “white belt" or "10th Kup”. Approximately once every four months all students will undergo a promotion test and, on being successful, the student will be awarded a new grade. 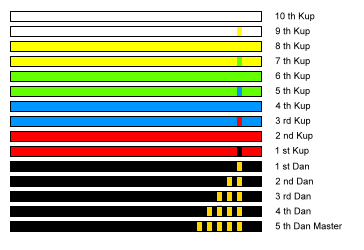 When reaching the grade of 1st Kup (red belt + black tag), the student will spend a minimum of six months preparing for his or her black belt grading (1st Dan). Bristish Taekwondo holds three black belt promotion tests per year (including one in Scotland). The Bristish Taekwondo black belt promotion test panel consists of a minimum of five Masters (5th Dan and above). Body armour is worn by the players above yellow belt.